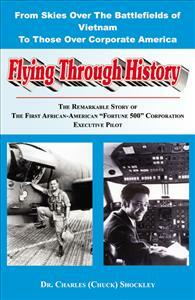 This book tells the remarkable story of the flying career of the author. From war, to carrying some of America’s most powerful people internationally as Fortune 500 Corporation’s first Black Executive Pilot. After his successes in civil Rights battles at lunch counter sit-ins (Virginia - 1960) and the race riots of Oxford, Mississippi (1962), Shockley’s military commander recommends him to Flight School. This book chronicles his flying career, which includes two tours of duty in Vietnam. He earns 27 air medals for his combat missions flying over hostile Vietnam battlefields. It covers his involvement during the historic TET Offensive in 1968 and later flying military intelligence officers through the dangerous “Berlin Corridor” over hostile communist East Germany. Finally, he breaks the color barrier as Fortune 500 Corporation’s first Black Executive Pilot opening the door for others.